Just along the coast from Fuengirola and easily reached by public transport (train, bus or taxi) you will find the town of Benalmádena. Over the last fifty years, this resort has evolved from a small, sleepy fishing village, to become a favourite destination for thousands of sun seeking holiday makers from northern Europe. With its great transport links by bus and train, it is so easy to visit other resorts and places of interest along the Costa del Sol and throughout Andalucía. Being just twelve miles from Málaga International airport, transfer to the resort by train or taxi takes less than twenty minutes. The resort itself has many attractions for visitors. These include the fantastic Puerto Marina, which houses many shops and restaurants and has been voted best marina in the world on three occasions. The marina itself offers over a thousand berths for boats and yachts. The landscaped Paloma park, with it’s large lake and water flume is everyone’s favourite. Peacocks, rabbits and other wildlife roam free, and children have two play parks to enjoy. The Costa del Sol’s only ice-rink is situated in Avenida Garcia Lorca. In Arroyo de la Miel, which is the resort’s commercial centre, you will find the compact Tivoli World amusement park as well as the cable car or teleférico, which transports you to the summit of Monte Calamorro 800 meters above sea-level. The ten minute journey gives fantastic views over the resort and as far as the north African coast on a clear day. The resort’s railway station is also in Arroyo de la Miel, and the half hourly service links Málaga, Málaga airport, Torremolinos and Fuengirola. Last but not least, there is Benalmádena Pueblo which contains the municipal town hall. This is a beautiful Spanish “pueblo blanco ” (white village) high up in the hills and overlooking the coast. Flowers adorn the balconies of many houses. Just outside the village is the Benalmádena Stupa, a large Buddhist monument, and also Colomares Castle. All in all, Benalmádena has all the ingredients for a fantastic holiday, and with three hundred sunny days each year it is unlikely that rain will spoil your stay here. First 4 Property Group is a leading real estate agency with several thousand properties available in Benálmadena and all along the western Costa del Sol. 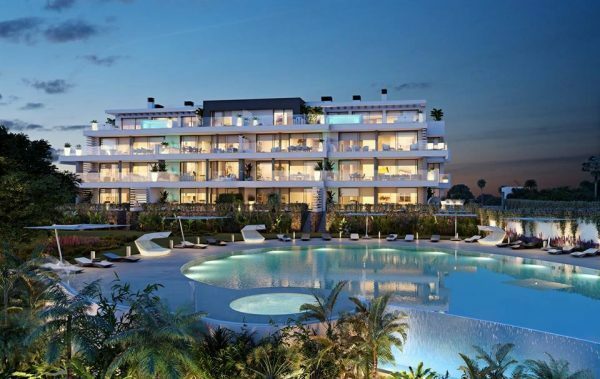 This means we have our finger on the pulse of every property for sale in the most sought-after developments on the Costa del Sol, from Málaga City to Sotogrande and many inland towns. With almost twenty years’ experience of helping expats purchase in the south of Spain, we are uniquely placed to serve the next wave of purchasers. Thanks to numerous long standing collaborations with top banks, developers, investors, local and international agents and with a wide range of re-sale properties available, we can guarantee you will find your new home in the sun. We are particularly proud of our knowledge and experience with new-builds and have a whole department focused on the premier new developments in the area. One particular development we are pleased to represent is the prestigious Higuerón West development next to Reserva del Higuerón Resort Sport Club and Nagomi Spa. This sits high in the hills overlooking Benálmadena and Fuengirola. Any discerning buyer looking to buy in this area will see that this offers quality, lifestyle facilities for holiday and year-round purchases.